My research with Nicole Westmarland into the possible use of restorative justice in cases of sexual violence gave rise to more in-depth questions about what really constitutes justice for victim-survivors. What does justice mean to survivors? Is a conviction and long prison sentence justice? Is having a voice and being treated with dignity important elements of securing justice? To examine these questions, and more, we held discussions and interviews with twenty victim-survivors of sexual violence to find out about their ideas and perspectives on justice. The concept that emerged, which best explains the variety and complexity of their ideas, is what we have called ‘kaleidoscopic justice‘. Read the research in full here. Policy Briefing available here. I have presented the findings of this research at Monash University in Australia, Lund University in Sweden, Leuven University in Belgium, in Iceland and across the UK. The study developes a new framework for thinking about justice from the perspective of victim-survivors of sexual violence, namely kaleidoscopic justice. 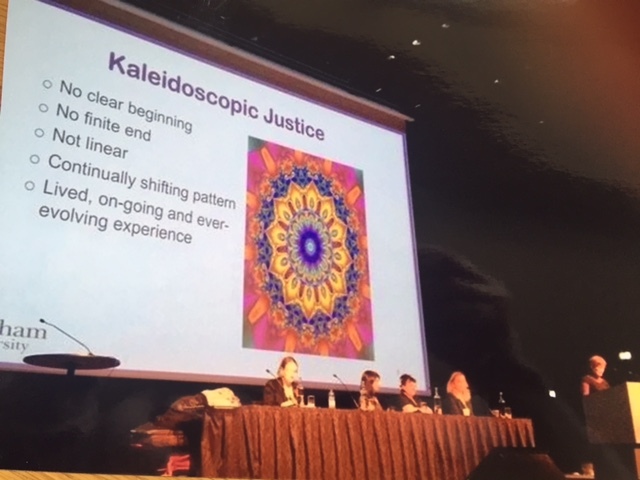 Developed from an empirical investigation into the perceptions of justice of a group of twenty victim-survivors of sexual violence, kaleidoscopic justice understands justice as a constantly shifting pattern; justice constantly refracted through new experiences or understandings; justice as an ever-evolving, nuanced and lived experience. Embedded in this conceptualisation are a number of key justice themes, namely justice as consequences, recognition, dignity, voice, prevention and connectedness. This new concept of justice develops current understandings, in particular by emphasising the fluidity of justice, as well as the centrality of prevention and connectedness in sexual violence survivors’ understandings of justice. We suggest that it is only by better understanding victim-survivor perspectives on justice, and embedding the concept of kaleidoscopic justice, that we can begin to address the sexual violence ‘justice gap’.